The Central Mass. Lacrosse Coaches Association has announced its US Lacrosse All-Americans, Academic All-Americans and Award Winners for 2017. In addition, the Coaches Association has also announced that the annual North/South CMass lacrosse All-Star game will be renamed "The John Pedace Memorial All-Star Game," in honor of former Tantasqua coach John Pedace, who tragically passed away earlier this week after a long battle with cancer. Here is a quick look at the deserving recipients. Chris Campbell, LSM, Shrewsbury, Jr.
One of the best defensive players and ground ball demons in the region, Campbell helped Shrewsbury win 10 in a row mid-season, to go from 2-5 to outright Mid-Wach A champs. The Hartford commit will be back for more next season, as he and the Colonials try to take the next step back to the district championship game. Anthony D'Angelo, M, Grafton, Sr. Ask any player in the Mid-Mass. conference to name some of the best players they've faced, and nearly all of them will mention D'Angelo, who has done a little bit of everything for the Indians over the past few years. Now a senior, the versatile middie began shouldering a bigger scoring load this season, and became one of Grafton's go-to play makers in crunch time. Drew Kozub, A, St. John's, Sr.
A natural scorer, Kozub tied for the regional lead in goals scored with 65, and also proved a capable creator for the stacked Pioneer attack and midfield. With a combination of skill, power and balance, keeping Kozub from putting the ball in the back of the net has been near impossible the past couple seasons. Ryan Richards, M, Nipmuc, Sr.
One of the most physically impressive all-around players in the region, there wasn't much Richards couldn't do in 2017. While his effort on both ends made him well-rounded, it was his cannon of a shot that made him one of the most feared offensive threats in Massachusetts. Griffin Shoemaker, A/M, Littleton, Sr.
Shoemaker is the only repeat All-American on the list, but he didn't simply recreate last season in 2017. Instead, the senior completely re-defined his game, as he moved from attack to midfield, and sacrificed stats for the betterment of the team. It paid off in a big way, as the Tigers had their most successful season ever, and will play for a Division 3 Central/East title Saturday against reigning state champion Dover-Sherborn. Jake Zablocki, FO/M, Shepherd Hill, Sr.
A physical, dirty-work player who dominates at the face-off X and on the ground, Zablocki has been a huge part of Shepherd Hill's success the past few years. While goals and assists get the headlines, you can't win without possession of the ball, and Zablocki was always there to secure it. Evan Radovanic, St. John's, Sr.
Jacob Squiter, Shepherd Hill, Sr.
Hard to deny the work Brockett did this season, as Nipmuc was one of the state's most improved teams. The Warriors went from a solid 13-win squad in 2016, to a (so far) 19-win district finalist this season, with wins over Grafton, Groton-Dunstable, Tantasqua (twice) and Western Mass power Mt. Greylock under their collective belt. Nipmuc will have a chance to win its first district title this Saturday in a rubber match against Grafton. Coach Murphy was tasked with re-building Groton-Dunstable's defense, and boy did he ever. Moving LSM Nate Forbes to defense, and putting former attackman Nevin Tardif between the pipes both paid dividends, as G-D's defense went from question mark to strength in a matter of games. The Crusaders finished the year with the fewest goals allowed in Mid-Wach A (5.9 per game). Could it be anyone else? For what he meant to the game, both on a state-wide level, and here in Central Mass, coach Pedace will be sorely missed. But, his passion for teaching and love for his players will always be remembered by those around Central Mass. We'll have our own All-Star team and Award Winners after the state championship, but every year I like to have a little fun and throw out a few kids that I think could have easily been named All-Americans. Obviously, the coaches know more than I do, so I'm not second-guessing them or calling these "snubs." These are just some players I think also deserve a little recognition. Kyle Laforge, M, Tyngsboro, Sr. Honestly, I'm a shocked that, for the second year in a row, Laforge isn't an All-American. After earning AA distinction as a sophomore in 2015, Laforge led the region in scoring last season, and was the top scorer in the Mid-Wach this year, while also handling face-off duties and playing D.
Laforge finishes his career as the best player in Tyngsboro lax history, a 400-point scorer and a former All-American, but you could argue he could have been an AA for three straight years. Liam McDonough, M, Groton-Dunstable, Jr.
McDonough was one of the best face-off guys in the state, and finished second in Mid-Wach A in scoring for a Groton-Dunstable team that surprised many early on in the year. The kid does it all, and will no doubt make a run at AA status next year during his senior campaign. Brandon Lefebvre, D, Nipmuc, Sr.
One of the best poles in the region, on one of the best defenses in the region, Lefebvre is yet another reason why Nipmuc was so dangerous this year. Tough to split hairs between defensive guys in the AA selection process, but Lefebvre was up there. Another really good defensive player, Gallagher will graduate as one of the best players in WooLax history. Often overlooked, Gallagher did whatever his team needed to do the past several seasons, and deserves some props for developing into a fine player after discovering the game late. Yeah, I can't name just one, and picking my All-Star goalies this year is going to be a nightmare. I mean, just look at Mid-Mass. where Matt Nicalek (Grafton), Alex Chu (Nipmuc) and Dan Hollis (Hopedale) all had fantastic seasons. Plus, Matt Mongeau was again dominant for St. John's, while first-year starters Nevin Tardif (Groton-Dunstable), Michael Fornal (Shrewsbury) and freshman Brandon Witherall (Littleton) all excelled. Geez, and I haven't even mentioned Dan Powers (Tyngsboro) or Will Wiegand (Wachusett) yet. Yeah, it was a great year between the pipes in CMass. I mentioned Matt Nicalek with the goalies, but really, anybody on Grafton's back line qualifies. 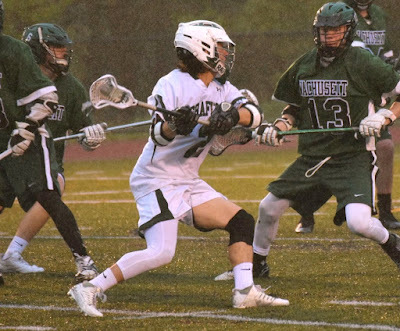 The Indians are stacked on D.
Ditto for Tantasqua's offense, where the senior attack trio of Mike Frio, Ben Beaudry and Anthony Law excelled, along with junior middie Tom Muir (who is an Academic AA). Finally, I have to give some credit to Monty Tech's Eric Glover and Mike Lee for helping that program take big steps the past few years, and Nashoba Valley Tech's Ryan Shaw, who led the region with 120 points, and helped NVT make the tournament. The Colonial doesn't get much coverage, but there was some fantastic Voke School lacrosse being played in Central MA this season.